Realme U1 smartphone first sales started at 5th December 2018. 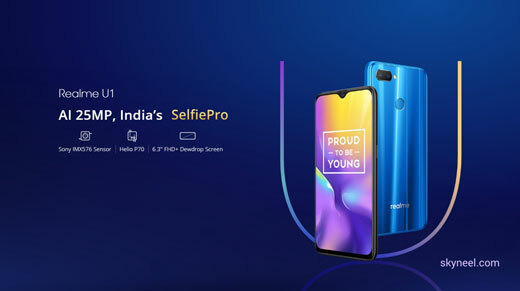 Now, Chinese company Realme has launched this phone in two variants 3+32GB/4+64GB which is priced at Rs. 11,999 and Rs. 14,499. It’s a great news for all those users who want to buy medium budget smartphone. This is the first smartphone which comes with MediaTek Helio P70 chip set. You can buy this latest technology smart on Amazon website. First flash started started on 5th December’2018 on Amazon website. The Realme U1 smartphone comes with 6.3 inch smartphone with 1080×2340 pixels resolution. This smartphone is powered by 2.1GHz octa-core processor which comes with 4GB high speed RAM and 64GB internal storage memory. You can easily expanded storage memory up to 256GB via microSD card. Realme U1 smartphone priced under Rs. 15,000 only. This smartphone runs on Android 8.1 Oreo operating system with 3500mAh non removable Li-Ion battery. You can check this Realme U1 review to know how the handset is, can it play PUBG game and is it a better option compared with the Redmi Note 5 and Redmi Note 6 Pro? If we talk about the camera, this smartphone comes with 13-megapixel (f/2.2) primary camera and a 2-megapixel (f/2.4) secondary camera on the rear and a 25-megapixel front shooter for selfies, with depth sensor. The dimension of this smartphone measured in 157x74x8mm with 168g weight. The Realme U1 dual sim GSM and GSM smartphone that accept Nano SIM and Nano SIM. Connectivity options include 3G, 4G with Wi-Fi, GPS, Bluetooth, USB OTG, Micro-USB, FM feature. You can also get Face unlock, Fingerprint sensor, Compass, Magnetometer, Proximity, Accelerator, Ambient light sensor. This smartphone supports Volte/4G/3G/2G on compatible networks. This smartphone is available in three Ambitious Black, Brave Blue, and Fiery Gold. As per price and processor this smartphone it too good for medium budgeted smartphone. This phone first sale start on Amazon.in website dated 5th Dec’18 at 12:00 PM. Processor 2.1GHz Octa-core processor, Mediatek Helio P70 Processor, Android 8.1 (Oreo) O.S., GPU Mali G72 MP3. Memory Available in two variants 3+32GB/4+64GB. Expandable up to 256GB via microSD. Display 6.3″ LTPS IPS LCD capacities touchscreen display. 1080 x 2340 resolution, Corning Gorilla Glass 3 with Color OS 5.2. Dimensions Height:157 mm, Width: 74 mm, Thickness: 8 mm, Weight: 168 g.
Price & Color Priced under Rs.15,000. Color: Ambitious Black, Brave Blue, and Fiery Gold. Incredible front camera with Sony IMX576 sensor. Much better fingerprint and face-look sensor. Rear camera comes with 2.2 aperture which is not good for low light. Redmi Note camera much better than Realme U1. Comes with acrylic plastic body which doesn’t give premium look.